Discussion in 'Mapping Questions & Discussion' started by Mathyaz, Mar 6, 2016. 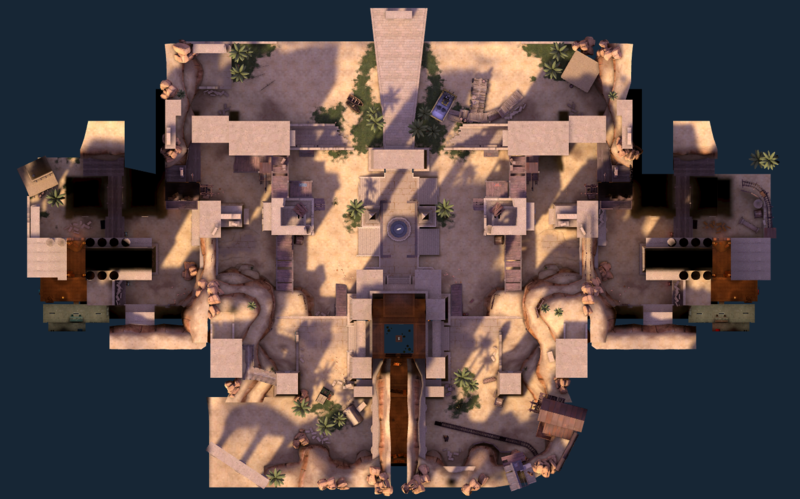 I posted on here a while ago about a map I had started as my first "get back into it" map (named koth_subplatform), and after some discussion and research, I figured out it was way more of a pain to deal with just one piece to this map. So instead, I split the ideas up into two different maps. However, within the last few days of working on each map separately, I had begun to put together ideas for other maps with different game modes as well. Each of these is in different parts of production, but there's no way I'd be able to work on more than one at a time. So, I'd like a little bit of opinion! I'll post information and blueprints to the maps I came up with, as well as a SOP (state of production) so that you can get a feel for how far along I am with them. Once you've gone through them, give me your opinion on which map I should work on first, or at all! Description: This is the first half of the abandoned koth_subplatform map I started: an underwater research facility. Here, I would make a giant, warehouse-like facility with multiple glass walls and windows to peer out into the ocean depths. Instead of building water around a near-floating structure, I would instead put the facility on the seabed so that it's easier to put water around. Being a koth map, there would be a central large room with a control point in the middle and multiple entrances. There would also be an underwater segment where you can enter a dive room on the side and proceed to either the other team's dive room, or a route that leads right to the control point. The rooms around this central large room would be small enough that I could get rid of them and transform this map into an arena map as well, provided I adjust prop locations and certain height changes. Description: This is the second half of koth_subplatform that came to be. I took the Big Shell (Metal Gear Solid 2)-like structure and brought it to the surface. Without having to worry about enclosing in bridges, I made them longer and wider, as well as four total floors for height advantage. However, to prevent snipers and other long range attackers from dominating the map, certain bridges will be built with covered areas, walls that break up the railings, and other prop emplacements, along with the most direct route to the capture point being multiple walls thick. There are quite a few options in terms of getting around, with large enclosures on either side of the bridges, multiple staircases, pipe-bridges, etc. I made the map large and diverse enough that I'm confident enough I could turn the gamerules into a capture the flag type as well. SOP: Blueprints done, no map files started whatsoever. Description: When I was in high school, I took classes for computer science. Programming, web design, flash animation. I even attended a technical school for two years alongside high school so I could broaden those horizons. I think now, what would be the ultimate tribute to those years than building my school inside a game engine for others to experience, too? This map is a very small, very simple map to build: two hallways, exactly the same in size and detail, that lead up to a larger connecting hallway, a second-floor stage, and two larger rooms on either side of that stage. Aside from the connecting hallways, most of the smaller classrooms and such would be able to connect to the other parts of the map. The only ones that wouldn't be able to are direct routes to the spawn rooms. This map would be totally indoors, but with windows that would peer outside to the rest of the schoolgrounds. Again, there is nothing aside from the blueprints to this map. SOP: Blueprints done, very basic road/travel path, little to no environment. Description: This is a bit of a personal undertaking, but it's probably the one I'm most excited about. I took a map of the town I live in (Wells River, VT) off Google Maps, traced over it in an image editor, and designed a capture point map on that map. I'll be making this in a somewhat realistic way, with businesses, scale road sizes, even environment detail like trees and the Connecticut River. There is very little done with this map right now. Only landmarks, dev texture roads, and capture point props for marking. This'll probably be the map that will have to have the most detail put into it, making it a huge undertaking. I'm also still pretty new to mapping, so I may just even shelve this idea for later. Description: Again, this one is another that just sorta popped into my head recently. A few weeks ago I journeyed to Concord, NH, where I went into one of their enormous stretches of malls. The structure's architecture stuck with me, and I've wanted to build digitally what I see in my mind. The only way I know how is with Source, so I figured, why not turn it into a fancy shmancy multiplayer game arena, too? The mall I entered was very square, or rectangular, with a large food court in the middle. The place I would build would be a large, indoor mall with arches and glass roofs along the hallways. In the center that divides the teams, a neutral control point in the middle of a grocery store. The control points would be fairly close together in terms of spawn room distance, however in order to capture the next point in the sequence, the players would have to trek across either the middle point, or around the halls to make it to the newly opened one. This would prevent players from being able to simply walk along the hallway to the next door shop to get the next capture point. Plus, pushing players along hallways forces them to play as a team, making sure that teamplay is essential to this map. Again, this map has nothing other than blueprints, so I can shelve it and play around with the idea some more before committing to it. And that's it! That concludes my mapset that I've been thinking about. I look forward to feedback, as well as opinion. Any help and thought would be greatly appreciated! I grow impatient with these malevolent slithering reptiles on this bloody aircraft. None of these seem like they'd be workable layouts at all. These maps are made up of different areas that are immediately adjacent to each other, and there are at least three routes to move between each. In TF2, team play is not about everyone pushing through the same route; rather, it's when each class uses its unique strengths in different ways to benefit the team - and that often means splitting up. For instance, a spy needs low-traffic flanking routes to approach a sentry nest and sap it so that the rest of the team can push through the main route. Scouts are fragile but highly mobile, so they perform best in open spaces where they can use their speed and double jumps to their advantage. Soldiers, demomen, and pyros excel in places where they can catch enemies at close range and make use of splash damage and fire. When you sit down to design a map, remember to design for TF2 first and foremost. It's a class based game, so it demands maps that cater to each of their play styles. I understand that balancing a map for all nine classes can seem overwhelming at first, but the quickest way to learn is to keep playing the game and study how different classes use the map differently. You'll get the hang of it with time. In his defence, a 2d image doesnt really give you information about hieght and in most cases a sence of scale. Agree'd. It seems like a lot of the spawns are way too close to key elements like the control points or flag. It can be fun to see what hammer and source are capable of as far as representing real world environments. It can be a good practice exercise and a way to familiarize yourself with hammer. If you're trying to make a playable map, tho, even a small town is generally larger than a normal tf2 map. Max area is generally "three or four large-ish buildings". The only modes I could see working are 3 stage a/d, mvm, or (god forbid) tc. Small town is the only one of this set that I can see working as a TF2 map. Do note, if you want the map to be taken seriously it will need play well, and if that means making changes to smalltown that don't match your real town, so be it. That being said, there are plenty of novelty maps used for trade servers, sfm projects, and gary's mod where quality gameplay isn't a concern. Maps like academy and supercenter got most of their inspiration from maps like cp_coldfront and ctf_turbine. There are plenty of successful indoor gameplay maps, and it's my hope I could nail down at least one of those. However, it did dawn on me that a majority of these maps didn't get designed well for the entirety of the classes. While I believe that teamplay is valuable for a game with the word "team" in it, I am probably going to go back through and redesign of a few of these with that in mind. The problem for me, with guides of maps that already exist, is that I do not want to make it feel like I just took the paths and structure from an already successful map and just change the theme. Hopefully, I'll find one that works out in the end, regardless. I'll probably get shelve maps like koth_platform and cp_smalltown until I get a better grasp for map design. Certain ones of these I do not want to screw up, as they're the ones I'm most excited about. Indoor areas can be tricky, yeah. Junction is often criticized for its multitude of small, cramped rooms and lack of ceiling space for jumpers, and Turbine for its elementary box-and-hallway-based layout. The main thing to consider is where the main objectives are and where most of the fighting will take place, and making sure those areas are spacious enough to fight comfortably in. Taking inspiration from the structure of good maps is actually encouraged. Of course you don't want to copy them outright, but there's a reason each gamemode has a sort of established "formula" that works best. I would recommend starting with these formulas until you understand what makes them so successful, and then move on to unique or innovative ideas after that. It's the same thing cartoon artists are told: you have to learn to draw realistic anatomy before you develop your own cartoon style. I wouldn't worry too much about it, turbine and junction were both maps that, at the time, WERE considered good. Even though they're outdated as all hell, it's still something you can learn from, and parts of the maps are still good. Turbine for instance still has a fun middle point. Some of junctions parts are still good, nothing wrong at all with looking how to make an indoor connector in junction. You just need to make sure you don't make the same mistakes those maps did. And you shouldn't worry about failing either. Inspiration or plans don't need to be used for just one map. I've rebuilt the map I'm working on twice to iron out issues with it, and now it's going pretty well for me. Not to say that sometimes you don't need to cut your losses, I've had to begrudgingly do that a few times, but going through something you don't want to screw up is just not the right mindset at all, you have to learn how to change things to make it work. That's the only way you can end up as a flexible mapmaker, and it's the only way you can ever make a layout that's truly fun to play. Having a passion for the layout isn't going to stop that, it's going to push you harder to make it function.